AP Forest Department Published the recent AP Forest Section Officer Notification 2019 @ psc.ap.gov.in on 13th February 2019 for all the interested Candidates who are living in the Andhra Pradesh State and this notice is published by the Andhra Pradesh Public Service Commission Board. The Online AP Forest Section Officer Application Form will be started form the 26th Feb 2019 and the deadline date is the 20th March 2019. Those who are eager to apply for this APPSC Forest Section Officer Jobs and have waiting for this Notification for a Long Time, for these candidates the Board have given the golden Opportunity this time in the form of the AP Forest Section Officer Recruitment 2019 Process. So gather all the Details and then apply for it. Most of the Credentials which are required for the Candidates about this Andhra Pradesh Forest Section Officer Jobs like the Educational Qualification, Age Limit, Selection Process, Vacancy Details, Application Fee, AP Forest Section Officer Salary all will be given in Detailed formate Here. So that all the candidates must get a clear view of this Notification Process and then get the eligibility factor to apply nor this Posts. To get the employment chance in the Andhra Pradesh state, use this AP FSO Notification for making the Candidates career better in the forest department Board. All the Pin to pin Description about this Jobs, we have included Here. The APPSC Forest Section Officer Vacancy Details as per the Board has given on based on the Carried forward as well as the fresh Vacamnies in an understandable Format we have given Here. Based on the candidate’s region wise, they have to identify the Number of the AP Forest Section Officer Posts that is allotted as per the district and then fill up the Application Form for taking the active participation In the selection Rounds. As well, the Board this time are in the planned manner, for this sake, they have announced the Exam Date for this 50 APPSC FSO Jobs which is going to organize on 02nd June 2019 for the eligible Candidates. So don’t be late to fill up the Application Form for this Job After picking out the eligibility, if they are suitable then fill up the AP Forest Section Officer Application Form From this page. Rs. 21, 230/- to Rs. 63, 010/- Will be given for the selected Candidates in this AP Forest Section Officer Jobs. AP Forest Department Board are recruiting the various number of the Candidates and have offered the 50 AP Forest Section Officer Posts for all the suitable candidates for this Jobs. The Basic Details of this Notification is published, so that after getting the rules and indications about the way of filling up the AP FSO Application Form, they will able to submit their application Within the due date of the 20th March 2019. Online applications will be started from the 26th February 2019. Selected the Candidates regions while filing up the application, Some of the Candidates will upload the documents which cannot understand and some will be like the blur images. At that moment, if they uploaded the same one, then the board will reject the Candidates AP Forest Section Officer Application Form. All the clear Details in the application will be necessary. Reading the whole APPSC FSO Notification is necessary which is given on this @recruitmentindia.in page or for more Details about this Jobs, they can refer to the Officials page @ psc.ap.gov.in. Candidates After submission of their AP Forest Section Officer Application Form for this Jobs, they have to make the necessary preparation Process by the use of this Syllabus which the Links will be pinned up here with the Free of cost for all the applied candidates for this AP Forest Section Officer Recruitment 2019. The Candidates applications will be accepted till the end Date only. Those who will submit their applications after the 20th March 2019, those application forms are not validated by the Andhra Pradesh Public Service Commission Board. For this only, they have to read out the psc.ap.gov.in Notification and then overall details about this Andhra Pradesh Forest Section Officer Posts will be understood easily. 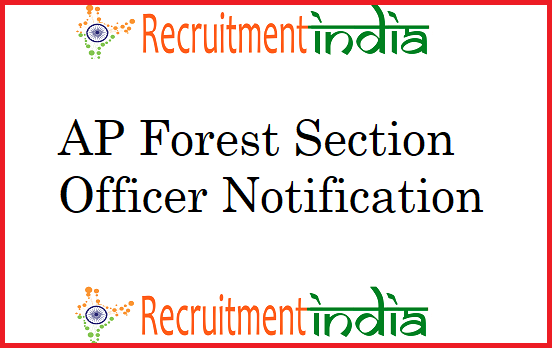 The post AP Forest Section Officer Notification 2019 | Apply For 50 AP FSO Jobs @ psc.ap.gov.in appeared first on Recruitment India.